Google has announced that the latest version of its Panda Update — a filter designed to penalise “thin” or poor content from ranking well — has been released. Google said that a “slow roll-out” began earlier last week and will continue to roll-out globally into next week, before being complete. Depending on location, about 3%-to-5% of search queries will be affected. So the roll-out is a slow, gradual one, it was planned for the end of the first week of October and is still rolling. The Panda 4.1 update will allow more high-quality small and medium-sized sites to rank better. Updates in the algorithm means there is a chance for penalised websites to now emerge! The rollout means anyone who was penalised by Panda in the last update has a chance to emerge, if they made the right changes to their websites. So if you were hit by Panda in the past, remember Penguin? …and had made alterations to your site, you’ll know very soon if these were good enough, as you will see an increase in traffic. The roll-out also means that new sites not previously hit by Panda might get impacted. If you’ve seen a sudden traffic drop from Google this week, or see a change in the coming days, then this latest Panda 4.1 Update is likely to blame. What is Google’s Objective with Panda 4.1? Google’s Panda updates are always aiming for quality enhancement of the search engine results. The first Panda update was known as the “content farm update”, because it was mainly directed against thin content that was placed on large scale platforms such as ezinearticles.com. Panda 4.0 was a major release of the whole Panda implementation in the algorithm. 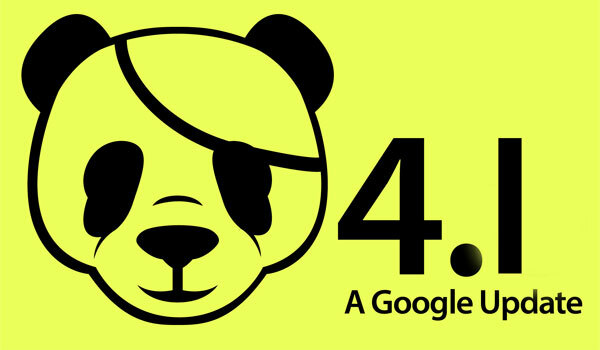 So Panda 4.1 is just the continuation of what Google did with 4.0. Panda roll-outs have been the biggest algorithm changes so far. 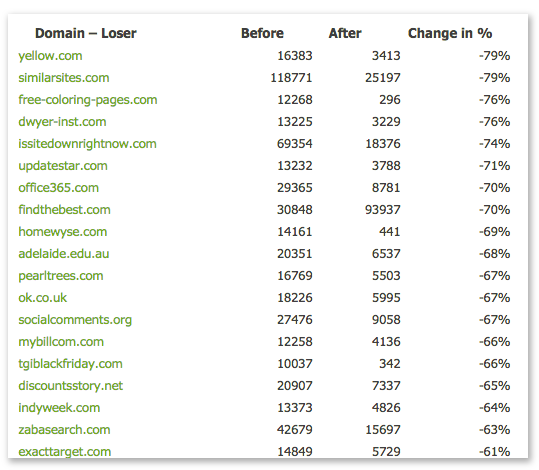 You can see that the Panda 4.1 update was rolled out on just a few winners and losers so far. There is always a pattern on the sites on these lists. Panda updates are query based. That means that the impact is not on all queries, only a specific set of queries and that’s why you can find a pattern. The changes seen this time are again directed against a lot of thin content and aggregator sites. Advice for Sites Hit by Panda 4.1? Housekeeping! Many websites just have too much thin content. They have to add value to these pages, find redundant pages and merge them or just delete them if it’s old outdated content. But most importantly, if you don’t do anything it will get worse. These pages that just keep their thin content will have a slow-death. They gradually lose visibility over time, so you must do something. That is why companies should build a Panda proof site before they are affected. The update should be good for small- to medium-sized businesses who prioritise the quality of their content. Ideally, the highest rankings of search queries should become more diversely populated with a wide range of different site sizes. This means site owners who have been stepping up their efforts to produce more high quality content should be rewarded with higher rankings as a result of the update. However, as with all Google updates, there’s also a chance to drop in the rankings as a result of Panda 4.1. If any of the “new signals” that determine the quality of the content on your site tell Google that you’re not up to their standards, you could suffer a drop, even if you’re doing everything else right. According to SearchMetrics, it looks like the biggest winners of the update are news sites, content-based sites, and download portals. The logic behind this indicates that because these sites are regularly updated with new, high-quality information, they’re getting an extra boost in favoritism thanks to whichever new ranking signals were added to the Panda code. It’s certain that Google will continue to update their algorithm with more sophisticated signals and ranking formulas…..it’s only a matter of when. But Panda 4.1 is continuing a several-year tradition of rewarding high-quality original content, and it’s likely that this trend will continue. The best thing you can do is refine your content creation strategy and make sure your blog is as original, unique, valuable, and well-written as possible. Publish new, high-quality content regularly, and you’ll put yourself in a perfect position for a boost when Panda 4.2 or possibly whatever the next update will be. Any questions please do let us know. The team at SEO Agency.